WhoooOOOWEEeee what a month I'm having. I just received a call from the DC Commission on the Arts and Humanities that they would like to acquire Beehive for sale or rent. This mixed media painting was on display at this years artomatic show. I love when my artwork is displayed in a public space for many to enjoy. What could be better than sharing my images and marks with many? This is one of my favorites that inspired me to do a series. The commission has acquired four pieces from me, but this is the first painting. The previous purchases were prints. 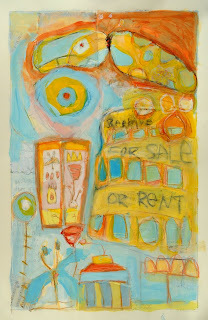 Beehive for sale or rent: Acrylic, graphite, crayon, canvas, collage, and found materials on paper. 26" x 40"
I just received a letter in the mail from the curator of book arts at the National Museum of Women in the Arts and they were pleased to inform me that after careful consideration the Works of Art Committee is delighted to accept my book, Inside my mind, for inclusion in the museum's collection. Well I just about burst into flames. I couldn't be happier. I called my mom, studio mates, friends and anyone who would listen (and not ask a book huh?). I think it's scheduled to be on display in 2009. If this isn't motivation to get in the studio and make more, I don't know what is. When I think back to last summer (just about a year ago to the day) when I made it, I remember I was relaxed, I was experimenting, and I was having fun. I started off in the morning enjoying the process and was not terribly concerned about the outcome. Unusual for me. Lucky for me. Matt Sesow, painting - yeow!!! This work is full of energy. You can't stand still looking at it. And by the way he's a totally nice relaxed dude. 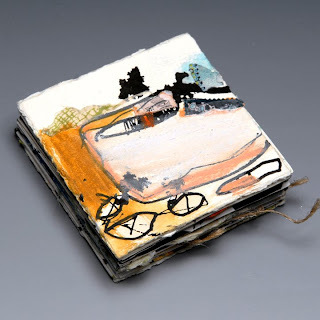 Novie Trump, ceramics - bringing new life to books, birds and all the possibilities of a neutral pallette. Just gorgeous. And by the way I think she has at least two other shows going on a the same time. Whew! Sean Madden and Nadia Mercer, installation - they made these birds, bulbs, twigs and chair look like they were meant to be together, like walking into a poem. Kevin Mellema, drawing - incredible figure drawing. I wonder how many sheets of that huge paper (at least 5 feet tall) did it take before he unleashed that one. The Howard Gardner School, doodles - a mixed media delight. Pure primative happiness, looks like these green beans know what they are doing. I think some of the most interesting mark making is happening here. Gail Vollrath, painting - speaking of mark making... incredible marks here too. The line is working hard and working well. Elizabeth Kendall, ceramics - another outstanding configuration that makes me wonder - how did she do that? How could I hang that in my house? Emery Lewis, painting - these are the kinds of abstractions I can look at time and time again and never get bored. Filled with gutsy textures and gorgeous palettes.